Delighted villagers outside The New Plough in Covenham St Bartholomew. 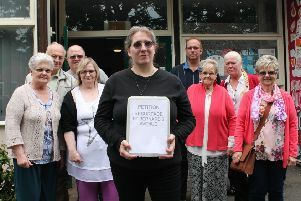 People power won the day in Covenham St Bartholomew, after a developer’s appeal to turn the defunct village pub into housing was dismissed. Villagers now plan to come together to develop plans to create a ‘Covenham Community Centre’ in the building, which would feature a small shop, cafe/pub, and a new function hall. As reported in November, Mr Julian Bland from Barnsley submitted a planning application to East Lindsey District Council with the proposal of converting the building into three houses, and an additional house to be built on land next to the existing building. The plans were initially recommended for approval by planning officers, despite dozens of objections from residents who did not want an important local amenity to be lost in order to make way for additional housing. In the end, ELDC’s Planning Committee rejected the plans on November 5 – but an appeal was lodged by the developer. An independent planning inspector, appointed by the Secretary of State for Communities and Local Government, visited Covenham on March 30 to assess the site – and revealed last Tuesday (April 26) that the appeal had been dismissed. Following the dismissal of the appeal, resident Dave Washer told the Leader that the residents were ‘ecstatic’ with the news. Mr Washer, who is part of the steering group which aims to develop the community centre, said: “We got the result we wanted, and now the hard work has got to start. “We successfully got an ACV (Asset of Community Value) put on the building last August, which means that the developer has got to give us the opportunity to buy the site from him when he sells the property. Mr Washer added: “We would like to thank all those in the community who have given support, attended meetings and turned out on the day of the planning committee decision – we had a good turnout on the day. The current suggestions for the community centre include a shop which would sell essentials such as bread and milk, a cafe area which would transform into a pub in the evenings, and a function room for parties, meetings, and other events.